Definition at line 23 of file testHttpRequest.cc. Definition at line 50 of file HttpRequest.h. Definition at line 26 of file testHttpRequest.cc. Definition at line 415 of file HttpRequest.cc. References HttpRequest::adaptHistory_, debugs, and HERE(). Referenced by HttpRequest::adaptLogHistory(), Format::Format::assemble(), HttpRequest::inheritProperties(), Adaptation::Icap::ModXact::makeRequestHeaders(), Adaptation::Ecap::XactionRep::masterxSharedValue(), ACLAdaptationServiceStrategy::match(), Adaptation::Icap::ModXact::parseIcapHead(), Adaptation::Iterator::start(), Adaptation::Iterator::step(), Adaptation::Ecap::XactionRep::updateHistory(), Adaptation::Iterator::updatePlan(), Adaptation::AccessCheck::usedDynamicRules(), and Ftp::Server::writeErrorReply(). Definition at line 432 of file HttpRequest.cc. Definition at line 426 of file HttpRequest.cc. Referenced by Adaptation::Icap::ModXact::parseIcapHead(), prepareLogWithRequestDetails(), Adaptation::Ecap::XactionRep::start(), Adaptation::Icap::ModXact::start(), Adaptation::Ecap::XactionRep::swanSong(), Adaptation::Icap::ModXact::swanSong(), and Adaptation::Ecap::XactionRep::updateHistory(). Definition at line 451 of file HttpRequest.cc. References Http::Message::body_pipe, BodyPipe::consumedSize(), and NULL. Referenced by FwdState::checkRetry(), and FwdState::reforward(). Definition at line 662 of file HttpRequest.cc. References Http::EXPECT, HttpHeader::has(), Http::Message::header, Http::Message::http_ver, and Http::ProtocolVersion(). Definition at line 777 of file HttpRequest.cc. References HttpRequest::effectiveRequestUri(), AnyP::Uri::getScheme(), HttpRequest::method, HttpRequest::url, and urlCanonicalCleanWithoutRequest(). Referenced by ClientHttpRequest::setLogUriToRequestUri(), and urlCanonicalFakeHttps(). Definition at line 123 of file HttpRequest.cc. References HttpRequest::adaptHistory_, HttpRequest::auth_user_request, Http::Message::body_pipe, Http::Message::cache_control, HttpHeader::clean(), String::clean(), AnyP::Uri::clear(), SBuf::clear(), HttpRequest::etag, HttpRequest::extacl_log, HttpRequest::extacl_message, HttpRequest::extacl_passwd, HttpRequest::extacl_user, Http::Message::header, HttpRequest::icapHistory_, HttpRequest::myportname, NULL, HttpRequest::range, HttpRequest::tag, HttpRequest::theNotes, HttpRequest::url, and HttpRequest::vary_headers. Referenced by HttpRequest::reset(), and HttpRequest::~HttpRequest(). Definition at line 490 of file HttpRequest.cc. References debugs, ERR_DETAIL_NONE, ERR_NONE, HttpRequest::errDetail, HttpRequest::errType, and HERE(). Referenced by Adaptation::Icap::ModXact::clearError(), FwdState::connectStart(), and Adaptation::Iterator::step(). Definition at line 177 of file HttpRequest.cc. References HttpHeader::append(), assert, Http::Message::body_pipe, HttpRequest::errType, HttpRequest::etag, HttpRequest::extacl_log, HttpRequest::extacl_message, Http::Message::hdr_sz, HttpRequest::hdrCacheInit(), Http::Message::header, HttpRequest::hier, Http::Message::http_ver, HttpRequest::HttpRequest(), HttpRequest::ims, HttpRequest::imslen, HttpRequest::inheritProperties(), HttpRequest::lastmod, HttpRequest::masterXaction, HttpRequest::method, Http::Message::pstate, HttpRequest::tag, HttpRequest::url, and HttpRequest::vary_headers. Definition at line 599 of file HttpRequest.cc. References HttpRequest::flags, HttpHeader::has(), Http::Message::header, Http::IF_MATCH, Http::IF_NONE_MATCH, and RequestFlags::ims. Definition at line 247 of file HttpRequest.h. Definition at line 476 of file HttpRequest.cc. References debugs, HttpRequest::errDetail, HttpRequest::errType, and HERE(). Referenced by ErrorState::BuildHttpReply(), Adaptation::Icap::ModXact::detailError(), Ftp::Client::failed(), Ftp::Relay::failedErrorMessage(), ClientHttpRequest::handleAdaptationBlock(), Client::handleAdaptationBlocked(), Client::handledEarlyAdaptationAbort(), ClientHttpRequest::noteBodyProducerAborted(), and ConnStateData::serveDelayedError(). Definition at line 27 of file testHttpRequest.cc. Definition at line 707 of file HttpRequest.cc. References AnyP::Uri::absolute(), AnyP::Uri::authority(), AnyP::Uri::getScheme(), HttpRequestMethod::id(), HttpRequest::method, Http::METHOD_CONNECT, AnyP::PROTO_AUTHORITY_FORM, and HttpRequest::url. Referenced by Format::Format::assemble(), HttpStateData::buildRequestPrefix(), HttpRequest::canonicalCleanUrl(), carpSelectParent(), ClientRequestContext::clientRedirectDone(), ErrorState::compileLegacyCode(), AccessLogEntry::effectiveVirginUrl(), ClientHttpRequest::handleAdaptedHeader(), HttpStateData::httpBuildRequestHeader(), ACLUrlStrategy::match(), Client::maybePurgeOthers(), HttpRequest::packFirstLineInto(), clientReplyContext::purgeAllCached(), clientReplyContext::purgeDoPurgeHead(), refreshCheck(), ClientHttpRequest::resetRequest(), Ssl::ServerBump::ServerBump(), HttpRequest::storeId(), Adaptation::Ecap::RequestLineRep::uri(), PeerSelector::url(), Ftp::UrlWith2f(), and ACLFilledChecklist::verifyAle(). Definition at line 514 of file HttpRequest.cc. References HttpHeader::chunked(), Http::Message::content_length, and Http::Message::header. Definition at line 543 of file HttpRequest.cc. References HttpRequest::HttpRequest(), HttpRequest::method, AnyP::Uri::parse(), and HttpRequest::url. Referenced by Http::One::Server::buildHttpRequest(), Downloader::buildRequest(), clientBeginRequest(), MimeIcon::created(), htcpUnpackSpecifier(), icpGetRequest(), netdbExchangeStart(), Ftp::Server::parseOneRequest(), peerCountMcastPeersStart(), peerDigestRequest(), UrnState::setUriResFromRequest(), Mgr::Inquirer::start(), storeDigestRewriteStart(), testHttpRequest::testCreateFromUrl(), and testHttpRequest::testIPv6HostColonBug(). Definition at line 621 of file HttpRequest.cc. References allow_t::allowed(), HttpRequest::client_addr, Config, debugs, ACLChecklist::fastCheck(), ACLFilledChecklist::my_addr, HttpRequest::my_addr, NULL, HttpRequest::rangeOffsetLimit, SquidConfig::rangeOffsetLimit, and ACLFilledChecklist::src_addr. Referenced by Http::Stream::buildRangeHeader(), CheckQuickAbortIsReasonable(), and HttpStateData::decideIfWeDoRanges(). Definition at line 245 of file HttpRequest.h. Definition at line 390 of file HttpRequest.cc. References assert, HttpHeader::getRange(), Http::Message::hdrCacheInit(), Http::Message::header, and HttpRequest::range. Referenced by HttpReply::httpMsgParseError(), and Http::Message::httpMsgParseStep(). References assert, buf, Http::Message::configureContentLengthInterpreter(), Http::Message::hdr_sz, Http::Message::hdrCacheInit(), Http::Message::header, httpMsgIsolateStart(), Http::Message::httpMsgParseError(), len, HttpHeader::parse(), Http::Message::parseFirstLine(), PROF_start, PROF_stop, Http::Message::psParsed, Http::Message::psReadyToParseHeaders, Http::Message::psReadyToParseStartLine, and Http::Message::pstate. Referenced by MemStore::copyFromShmSlice(), Http::Message::parse(), and Http::Message::parseCharBuf(). Definition at line 400 of file HttpRequest.cc. References debugs, HERE(), HttpRequest::icapHistory_, IcapLogfileStatus, LOG_ENABLE, and Log::TheConfig. Referenced by Adaptation::AccessCheck::AccessCheck(), ClientHttpRequest::doCallouts(), Adaptation::Icap::ModXact::finalizeLogInfo(), HttpRequest::inheritProperties(), ClientHttpRequest::noteAdaptationAclCheckDone(), prepareLogWithRequestDetails(), Adaptation::Icap::ModXactLauncher::updateHistory(), and Adaptation::AccessCheck::~AccessCheck(). Definition at line 648 of file HttpRequest.cc. References debugs, NULL, and HttpRequest::range. Referenced by Http::Stream::buildRangeHeader(), clientInterpretRequestHeaders(), HttpStateData::httpBuildRequestHeader(), clientReplyContext::setReplyToError(), clientReplyContext::setReplyToReply(), and clientReplyContext::setReplyToStoreEntry(). Definition at line 216 of file HttpRequest.cc. References HttpRequest::adaptHistory(), HttpRequest::adaptHistory_, HttpRequest::auth_user_request, HttpRequest::client_addr, HttpRequest::clientConnectionManager, RequestFlags::cloneAdaptationImmune(), HttpRequest::dnsWait, HttpRequest::downloader, HttpRequest::errDetail, HttpRequest::errType, HttpRequest::extacl_passwd, HttpRequest::extacl_user, HttpRequest::flags, HttpRequest::forcedBodyContinuation, HttpRequest::icapHistory(), HttpRequest::icapHistory_, HttpRequest::indirect_client_addr, HttpRequest::my_addr, HttpRequest::myportname, Http::Message::sources, and HttpRequest::theNotes. Definition at line 77 of file HttpRequest.cc. References HttpRequest::adaptHistory_, HttpRequest::auth_user_request, Http::Message::body_pipe, AnyP::Uri::clear(), HttpRequest::client_addr, HttpRequest::dnsWait, ERR_DETAIL_NONE, ERR_NONE, HttpRequest::errDetail, HttpRequest::errType, HttpRequest::extacl_log, HttpRequest::extacl_message, HttpRequest::extacl_passwd, HttpRequest::extacl_user, HttpRequest::flags, HttpRequest::forcedBodyContinuation, HttpRequest::icapHistory_, HttpRequest::ims, HttpRequest::imslen, HttpRequest::indirect_client_addr, HttpRequest::lastmod, HttpRequest::method, Http::METHOD_NONE, HttpRequest::my_addr, HttpRequest::myportname, NULL, null_string, HttpRequest::peer_domain, HttpRequest::peer_host, HttpRequest::peer_login, Http::Message::psReadyToParseStartLine, Http::Message::pstate, HttpRequest::range, HttpRequest::rangeOffsetLimit, Ip::Address::setEmpty(), HttpRequest::tag, HttpRequest::url, and HttpRequest::vary_headers. Referenced by HttpRequest::HttpRequest(), and HttpRequest::reset(). Definition at line 69 of file HttpRequest.cc. References HttpRequest::method, AnyP::Uri::path(), AnyP::Uri::setScheme(), and HttpRequest::url. Definition at line 737 of file HttpRequest.cc. References SquidConfig::accessList, ACLFilledChecklist::al, allow_t::allowed(), HttpRequest::client_addr, Server::clientConnection, HttpRequest::clientConnectionManager, COMM_INTERCEPTION, COMM_TRANSPARENT, Config, ACLChecklist::fastCheck(), HttpRequest::flags, RequestFlags::ignoreCc, HttpRequest::indirect_client_addr, RequestFlags::intercepted, RequestFlags::interceptTproxy, HttpRequest::my_addr, HttpRequest::myportname, port, ConnStateData::port, SquidConfig::spoof_client_ip, RequestFlags::spoofClientIp, ACLFilledChecklist::syncAle(), and CbcPointer< Cbc >::valid(). true Possibly cacheable. Response factors will determine. Are responses to this request possible cacheable ? If false then no matter what the response must not be cached. Definition at line 558 of file HttpRequest.cc. References Http::Message::cache_control, HttpRequest::flags, AnyP::Uri::getScheme(), gopherCachable(), HttpHdrCc::hasNoStore(), RequestFlags::hostVerified, RequestFlags::ignoreCc, RequestFlags::intercepted, RequestFlags::interceptTproxy, HttpRequest::method, AnyP::PROTO_CACHE_OBJECT, AnyP::PROTO_GOPHER, AnyP::PROTO_HTTP, AnyP::PROTO_HTTPS, HttpRequestMethod::respMaybeCacheable(), and HttpRequest::url. Definition at line 445 of file HttpRequest.cc. Referenced by clientReplyContext::buildReplyHeader(), and HttpStateData::httpBuildRequestHeader(). Definition at line 715 of file HttpRequest.cc. Referenced by Http::One::Server::buildHttpRequest(), ClientHttpRequest::initRequest(), AccessLogEntry::syncNotes(), and UpdateRequestNotes(). Definition at line 355 of file HttpRequest.cc. References Packable::append(), Packable::appendf(), assert, Http::Message::header, Http::Message::http_ver, HttpRequestMethod::image(), AnyP::ProtocolVersion::major, HttpRequest::method, AnyP::ProtocolVersion::minor, HttpHeader::packInto(), AnyP::Uri::path(), SQUIDSBUFPH, SQUIDSBUFPRINT, and HttpRequest::url. Referenced by Ftp::Server::handleRequest(), httpRequestPack(), and HttpRequest::swapOut(). Definition at line 498 of file HttpRequest.cc. References Packable::appendf(), HttpRequest::effectiveRequestUri(), Http::Message::http_ver, HttpRequestMethod::image(), AnyP::ProtocolVersion::major, HttpRequest::method, AnyP::ProtocolVersion::minor, AnyP::Uri::path(), SQUIDSBUFPH, SQUIDSBUFPRINT, and HttpRequest::url. References Packable::append(), Http::Message::header, Http::Message::packFirstLineInto(), and HttpHeader::packInto(). References assert, Config, DBG_IMPORTANT, debugs, Http::Message::hdr_sz, headersEnd(), Http::Message::httpMsgParseStep(), int, SquidConfig::maxReplyHeaderSize, Http::Message::sanityCheckStartLine(), Http::scHeaderTooLarge, Http::scInvalidHeader, and Http::scNone. References MemBuf::append(), MemBuf::buf, MemBuf::clean(), Http::Message::httpMsgParseStep(), MemBuf::init(), Http::Message::reset(), MemBuf::size, and MemBuf::terminate(). Definition at line 297 of file HttpRequest.cc. 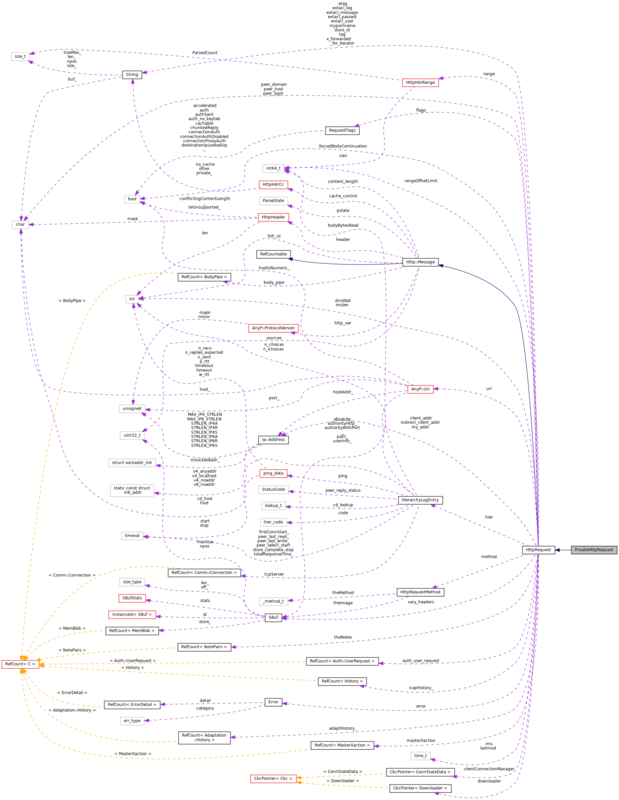 References DBG_IMPORTANT, debugs, findTrailingHTTPVersion(), Http::Message::http_ver, HttpRequestMethod::HttpRequestMethodXXX(), AnyP::ProtocolVersion::major, HttpRequest::method, Http::METHOD_NONE, AnyP::ProtocolVersion::minor, AnyP::Uri::parse(), HttpRequest::url, w_space, and xisspace. References SBuf::c_str(), Http::Message::configureContentLengthInterpreter(), Http::Message::hdr_sz, Http::Message::hdrCacheInit(), Http::Message::header, Http::One::Parser::headerBlockSize(), Http::One::Parser::messageHeaderSize(), Http::One::Parser::mimeHeader(), HttpHeader::parse(), Http::Message::psError, Http::Message::psParsed, and Http::Message::pstate. Parses request header using Parser. Use it in contexts where the Parser object is available. Definition at line 674 of file HttpRequest.cc. Referenced by Http::One::Server::buildHttpRequest(), HttpRequest::configureContentLengthInterpreter(), and htcpClrStore(). Parses request header from the buffer. Use it in contexts where the Parser object not available. Definition at line 681 of file HttpRequest.cc. References Http::Message::header, Http::Message::http_ver, httpHeaderHasConnDir(), and Http::ProtocolVersion(). Definition at line 688 of file HttpRequest.cc. References HttpRequest::clientConnectionManager, CbcPointer< Cbc >::get(), NULL, ConnStateData::pinned, ConnStateData::pinning, and CbcPointer< Cbc >::valid(). Referenced by borrowPinnedConnection(), clientReplyContext::buildReplyHeader(), clientCheckPinning(), FwdState::fail(), FwdState::stopAndDestroy(), and FwdState::usePinned(). Definition at line 380 of file HttpRequest.cc. References Http::Message::header, HttpRequestMethod::image(), HttpHeader::len, SBuf::length(), HttpRequest::method, AnyP::Uri::path(), and HttpRequest::url. Referenced by peerDigestFetchSetStats(), and clientReplyContext::traceReply(). Definition at line 467 of file HttpRequest.cc. References RequestFlags::auth_no_keytab, debugs, HttpRequest::flags, HttpRequest::peer_domain, and HttpRequest::peer_login. Referenced by FwdState::dispatch(), switchToTunnel(), and tunnelConnectDone(). Definition at line 457 of file HttpRequest.cc. References RequestFlags::auth_no_keytab, CachePeer::auth_no_keytab, debugs, CachePeer::domain, HttpRequest::flags, CachePeer::host, CachePeer::login, CachePeer::options, CachePeer::originserver, HttpRequest::peer_domain, and HttpRequest::peer_login. Referenced by FwdState::dispatch(), Http::Tunneler::start(), switchToTunnel(), and tunnelConnectDone(). References Http::CACHE_CONTROL, Http::Message::cache_control, HttpHeader::delById(), Http::Message::header, and HttpHeader::putCc(). Definition at line 607 of file HttpRequest.cc. References debugs, HttpRequest::dnsWait, and Dns::LookupDetails::wait. Referenced by DestinationIPLookup::checkForAsync(), SourceDomainLookup::LookupDone(), and DestinationDomainLookup::LookupDone(). Definition at line 170 of file HttpRequest.cc. Checks the first line of an HTTP request is valid currently just checks the request method is present. NP: Other errors are left for detection later in the parse. Definition at line 271 of file HttpRequest.cc. References debugs, HERE(), HttpRequestMethod::HttpRequestMethodXXX(), Http::METHOD_NONE, and Http::scInvalidHeader. References Http::CONTENT_LENGTH, Http::Message::content_length, HttpHeader::delById(), Http::Message::header, and HttpHeader::putInt64(). Returns the current StoreID for the request as a nul-terminated char*. Always returns the current id for the request (either the effective request URI or modified ID by the helper). Definition at line 696 of file HttpRequest.cc. References debugs, HttpRequest::effectiveRequestUri(), String::size(), HttpRequest::store_id, and StringToSBuf(). Referenced by clientReplyContext::cacheHit(), ClientHttpRequest::doCallouts(), storeKeyPublicByRequestMethod(), and storeSwapMetaBuild(). Definition at line 345 of file HttpRequest.cc. References assert, StoreEntry::buffer(), StoreEntry::flush(), and HttpRequest::pack(). Definition at line 127 of file HttpRequest.h. Referenced by Format::Format::assemble(), Auth::UserRequest::authenticate(), AuthenticateAcl(), authTryGetUser(), ConnStateData::buildFakeRequest(), clientReplyContext::buildReplyHeader(), ClientHttpRequest::calloutsError(), HttpRequest::clean(), clientProcessRequest(), ErrorState::compileLegacyCode(), constructHelperQuery(), DelayId::DelayClient(), Auth::UserRequest::helperRequestKeyExtras(), Log::Format::HttpdCombined(), Log::Format::HttpdCommon(), httpFixupAuthentication(), HttpRequest::inheritProperties(), HttpRequest::init(), Adaptation::Icap::ModXact::makeUsernameHeader(), peerUserHashSelectParent(), Log::Format::SquidIcap(), Log::Format::SquidNative(), ClientHttpRequest::sslBumpEstablish(), statClientRequests(), Auth::UserRequest::tryToAuthenticateAndSetAuthUser(), and Adaptation::Ecap::XactionRep::usernameValue(). Referenced by HttpRequest::bodyNibbled(), FwdState::checkRetriable(), HttpRequest::clean(), HttpReply::clean(), clientProcessRequest(), ClientRequestContext::clientRedirectDone(), HttpRequest::clone(), HttpReply::clone(), Adaptation::Ecap::MessageRep::clone(), FwdState::doneWithRetries(), Adaptation::Icap::ModXact::estimateVirginBody(), Adaptation::Icap::ModXact::finalizeLogInfo(), Adaptation::Iterator::handleAdaptationError(), ClientHttpRequest::handleAdaptationFailure(), Client::handleAdaptedHeader(), HttpRequest::init(), Adaptation::Icap::ModXact::makeAdaptedBodyPipe(), Adaptation::Icap::ModXact::prepEchoing(), Adaptation::Icap::ModXact::prepPartialBodyEchoing(), Adaptation::Ecap::XactionRep::preserveVb(), HttpStateData::sendRequest(), Adaptation::Message::set(), Adaptation::Icap::InOut::setHeader(), Adaptation::Message::ShortCircuit(), Adaptation::Ecap::XactionRep::sinkVb(), Client::startAdaptation(), Client::startRequestBodyFlow(), Adaptation::Ecap::MessageRep::tieBody(), Adaptation::Ecap::XactionRep::useAdapted(), Adaptation::Ecap::XactionRep::useVirgin(), and Http::Message::~Message(). Referenced by HttpRequest::clean(), clientInterpretRequestHeaders(), MimeIcon::created(), HttpReply::hdrCacheClean(), Http::Message::hdrCacheInit(), HttpReply::hdrExpirationTime(), HttpReply::make304(), HttpRequest::maybeCacheable(), mcast_encode(), ClientHttpRequest::onlyIfCached(), Http::Message::putCc(), refreshCheck(), and HttpStateData::reusableReply(). Definition at line 149 of file HttpRequest.h. Referenced by Format::Format::assemble(), Downloader::buildRequest(), clientBeginRequest(), Adaptation::Ecap::XactionRep::clientIpValue(), DelayId::DelayClient(), ClientHttpRequest::doCallouts(), ErrorState::ErrorState(), Adaptation::Icap::ModXact::finalizeLogInfo(), getOutgoingAddress(), HttpRequest::getRangeOffsetLimit(), HttpStateData::handleMoreRequestBodyAvailable(), HttpStateData::httpBuildRequestHeader(), HttpRequest::inheritProperties(), HttpRequest::init(), Adaptation::Icap::ModXact::makeRequestHeaders(), HttpRequest::manager(), peerSourceHashSelectParent(), HttpStateData::processReplyBody(), ACLFilledChecklist::setRequest(), FwdState::Start(), and tunnelStart(). Definition at line 230 of file HttpRequest.h. Referenced by Format::Format::assemble(), Ssl::PeekingPeerConnector::checkForPeekAndSplice(), Ssl::PeekingPeerConnector::checkForPeekAndSpliceGuess(), Ssl::PeekingPeerConnector::checkForPeekAndSpliceMatched(), clientCheckPinning(), FwdState::completed(), FwdState::connectStart(), copyResultsFromEntry(), FwdState::dispatch(), Ftp::Relay::forwardPreliminaryReply(), HttpStateData::handle1xx(), Ftp::Relay::handleControlReply(), Ssl::PeekingPeerConnector::handleServerCertificate(), HttpRequest::inheritProperties(), Ssl::PeekingPeerConnector::initialize(), HttpRequest::manager(), Ssl::PeekingPeerConnector::noteNegotiationDone(), HttpRequest::pinnedConnection(), clientReplyContext::processExpired(), clientReplyContext::processMiss(), HttpStateData::processReplyBody(), PeerSelector::resolveSelected(), Ftp::Relay::sendCommand(), Ssl::PeekingPeerConnector::serverCertificateVerified(), Ftp::Relay::serverComplete(), ACLFilledChecklist::setRequest(), Ftp::Relay::startDirTracking(), Ftp::Relay::stopOriginWait(), FwdState::successfullyConnectedToPeer(), switchToTunnel(), and Ftp::Relay::updateMaster(). Referenced by Adaptation::Ecap::HeaderRep::add(), HttpReply::bodySize(), Http::Stream::buildRangeHeader(), HttpHdrRange::canonize(), CheckQuickAbortIsReasonable(), StoreEntry::checkTooBig(), clientBeginRequest(), clientIsContentLengthValid(), clientProcessRequest(), HttpReply::expectingBody(), HttpRequest::expectingBody(), Downloader::handleReply(), HttpReply::hdrCacheInit(), Http::Message::hdrCacheInit(), StoreEntry::modifiedSince(), HttpStateData::persistentConnStatus(), HttpReply::redirect(), refreshIsCachable(), Adaptation::Ecap::HeaderRep::removeAny(), HttpStateData::sendRequest(), Http::Message::setContentLength(), HttpReply::setHeaders(), storeLog(), clientReplyContext::storeNotOKTransferDone(), HttpStateData::truncateVirginBody(), HttpReply::validatorsMatch(), and StoreEntry::validLength(). Definition at line 159 of file HttpRequest.h. Referenced by Format::Format::assemble(), HttpRequest::inheritProperties(), HttpRequest::init(), prepareLogWithRequestDetails(), and HttpRequest::recordLookup(). Definition at line 233 of file HttpRequest.h. Referenced by Downloader::buildRequest(), Security::PeerConnector::checkForMissingCertificates(), HttpRequest::inheritProperties(), and Security::PeerConnector::startCertDownloading(). Definition at line 162 of file HttpRequest.h. Referenced by Format::Format::assemble(), HttpRequest::clearError(), HttpRequest::detailError(), HttpRequest::inheritProperties(), HttpRequest::init(), prepareLogWithRequestDetails(), and Ftp::Server::writeErrorReply(). Definition at line 161 of file HttpRequest.h. Referenced by Format::Format::assemble(), HttpRequest::clearError(), HttpRequest::clone(), HttpRequest::detailError(), HttpRequest::inheritProperties(), HttpRequest::init(), ACLSquidErrorStrategy::match(), prepareLogWithRequestDetails(), Ftp::Server::writeErrorReply(), and ClientHttpRequest::~ClientHttpRequest(). Definition at line 192 of file HttpRequest.h. Referenced by HttpRequest::clean(), HttpRequest::clone(), HttpStateData::httpBuildRequestHeader(), clientReplyContext::processExpired(), clientReplyContext::restoreState(), and clientReplyContext::saveState(). Definition at line 183 of file HttpRequest.h. Referenced by Format::Format::assemble(), HttpRequest::clean(), HttpRequest::clone(), copyResultsFromEntry(), and HttpRequest::init(). Definition at line 185 of file HttpRequest.h. Referenced by HttpRequest::clean(), HttpRequest::clone(), ErrorState::compileLegacyCode(), copyResultsFromEntry(), and HttpRequest::init(). Definition at line 181 of file HttpRequest.h. Referenced by HttpRequest::clean(), copyResultsFromEntry(), httpFixupAuthentication(), HttpRequest::inheritProperties(), HttpRequest::init(), and Adaptation::Icap::ModXact::makeRequestHeaders(). Definition at line 179 of file HttpRequest.h. Referenced by Format::Format::assemble(), HttpRequest::clean(), copyResultsFromEntry(), AccessLogEntry::getExtUser(), httpFixupAuthentication(), HttpRequest::inheritProperties(), HttpRequest::init(), Adaptation::Icap::ModXact::makeRequestHeaders(), Adaptation::Icap::ModXact::makeUsernameHeader(), ACLExtUser::match(), prepareLogWithRequestDetails(), statClientRequests(), and Adaptation::Ecap::XactionRep::usernameValue(). Definition at line 141 of file HttpRequest.h. Referenced by StoreEntry::adjustVary(), AuthenticateAcl(), clientReplyContext::buildReplyHeader(), HttpStateData::buildRequestPrefix(), clientReplyContext::cacheHit(), DestinationIPLookup::checkForAsync(), CheckQuickAbortIsReasonable(), FwdState::checkRetry(), clientReplyContext::checkTransferDone(), clientBeginRequest(), clientCheckPinning(), TunnelStateData::clientExpectsConnectResponse(), clientFollowXForwardedForCheck(), clientHierarchical(), clientInterpretRequestHeaders(), clientProcessRequest(), clientProcessRequestFinished(), ClientRequestContext::clientRedirectDone(), clientSetKeepaliveFlag(), FwdState::completed(), HttpRequest::conditional(), FwdState::connectDone(), FwdState::connectStart(), HttpStateData::continueAfterParsingHeader(), copyOneHeaderFromClientsideRequestToUpstreamRequest(), HttpStateData::decideIfWeDoRanges(), FwdState::dispatch(), ClientHttpRequest::doCallouts(), errorAppendEntry(), FindListeningPortAddress(), getOutgoingAddress(), ClientHttpRequest::handleAdaptedHeader(), clientReplyContext::handleIMSReply(), Http::One::Server::handleReply(), StoreEntry::hasIfNoneMatchEtag(), HttpStateData::httpBuildRequestHeader(), httpFixupAuthentication(), httpMaybeRemovePublic(), HttpStateData::HttpStateData(), clientReplyContext::identifyFoundObject(), clientReplyContext::identifyStoreObject(), HttpRequest::inheritProperties(), HttpRequest::init(), Ssl::PeekingPeerConnector::initialize(), ConnStateData::initiateTunneledRequest(), FwdState::makeConnectingError(), HttpRequest::manager(), ACLDestinationASNStrategy::match(), ACLDestinationIP::match(), ACLProxyAuth::matchProxyAuth(), HttpRequest::maybeCacheable(), neighborsDigestSelect(), netdbExchangeStart(), ErrorState::NewForwarding(), Ssl::PeekingPeerConnector::noteNegotiationDone(), CacheManager::ParseHeaders(), Ftp::Server::parseOneRequest(), peerAllowedToUse(), peerDigestRequest(), peerSelectIcpPing(), HttpStateData::peerSupportsConnectionPinning(), peerWouldBePinged(), ConnStateData::pinConnection(), FwdState::pinnedCanRetry(), HttpRequest::prepForDirect(), HttpRequest::prepForPeering(), clientReplyContext::processConditional(), clientReplyContext::processExpired(), clientReplyContext::processMiss(), HttpStateData::processReplyBody(), HttpStateData::processReplyHeader(), ClientHttpRequest::processRequest(), HttpStateData::processSurrogateControl(), ConnStateData::quitAfterError(), FwdState::reforward(), refreshCheck(), refreshCheckHTTP(), clientReplyContext::replyStatus(), PeerSelector::resolveSelected(), HttpStateData::reusableReply(), FwdState::secureConnectionToPeerIfNeeded(), Http::Stream::sendBody(), clientReplyContext::sendNotModified(), HttpStateData::sendRequest(), Http::Stream::sendStartOfMessage(), clientReplyContext::sendStreamError(), Ssl::ServerBump::ServerBump(), clientReplyContext::setReplyToError(), ClientHttpRequest::sslBumpStart(), FwdState::Start(), FwdState::start(), FwdState::usePinned(), and Http::Stream::writeComplete(). Definition at line 195 of file HttpRequest.h. Referenced by HttpStateData::handle1xx(), Ftp::Server::handleUploadRequest(), HttpRequest::inheritProperties(), HttpRequest::init(), Http::One::Server::processParsedRequest(), and Ftp::Relay::readDataReply(). Referenced by StoreEntry::append(), CheckQuickAbortIsReasonable(), HttpRequest::clone(), HttpReply::clone(), StoreEntry::contentLen(), MemObject::expectedReplySize(), Adaptation::Icap::OptXact::finalizeLogInfo(), Adaptation::Icap::ModXact::finalizeLogInfo(), Http::Tunneler::handleResponse(), Http::Message::httpMsgParseStep(), MemObject::markEndOfReplyHeaders(), Http::Message::parse(), Http::Message::parseHeader(), Adaptation::Icap::ModXact::parseHttpHead(), Adaptation::Icap::Xaction::parseHttpMsg(), Adaptation::Icap::ModXact::prepEchoing(), clientReplyContext::processReplyAccess(), clientReplyContext::processReplyAccessResult(), MemObject::readAheadPolicyCanRead(), store_client::readBody(), MemStore::updateHeadersOrThrow(), and StoreEntry::validLength(). Referenced by StoreEntry::adjustVary(), Ftp::Gateway::appendSuccessHeader(), Format::Format::assemble(), assembleVaryKey(), authDigestNoncePurge(), Auth::UserRequest::authenticate(), ConnStateData::buildFakeRequest(), ErrorState::BuildHttpReply(), Http::One::Server::buildHttpRequest(), Http::Stream::buildRangeHeader(), clientReplyContext::buildReplyHeader(), Downloader::buildRequest(), ESIVarState::buildVary(), HttpRequest::canHandle1xx(), HttpRequest::clean(), HttpReply::clean(), clientBeginRequest(), clientCheckPinning(), clientGetMoreData(), clientIfRangeMatch(), clientInterpretRequestHeaders(), clientIsContentLengthValid(), clientProcessRequest(), HttpRequest::clone(), HttpReply::clone(), ErrorState::compileLegacyCode(), HttpRequest::conditional(), Adaptation::Icap::Options::configure(), MimeIcon::created(), Ftp::Relay::createHttpReply(), ErrorState::Dump(), Adaptation::Icap::ModXact::encapsulateHead(), ESIContextNew(), Adaptation::Icap::ModXact::expectIcapTrailers(), HttpReply::expectingBody(), HttpRequest::expectingBody(), Mgr::Action::fillEntry(), Adaptation::Icap::ModXact::finalizeLogInfo(), Ftp::Gateway::ftpAuthRequired(), ftpSendStor(), Ssl::ErrorDetailsManager::getErrorDetail(), Adaptation::Icap::ModXact::gotEncapsulated(), Adaptation::Icap::OptXact::handleCommRead(), Ftp::Server::handleFeatReply(), Ftp::Server::handleRequest(), StoreEntry::hasIfMatchEtag(), StoreEntry::hasIfNoneMatchEtag(), StoreEntry::hasOneOfEtags(), HttpReply::hdrCacheInit(), Http::Message::hdrCacheInit(), HttpRequest::hdrCacheInit(), HttpReply::hdrExpirationTime(), HttpStateData::httpBuildRequestHeader(), Log::Format::HttpdCombined(), httpMakeVaryMark(), Http::Message::httpMsgParseStep(), Ftp::HttpReplyWrapper(), TemplateFile::loadFor(), Ftp::Gateway::loginFailed(), HttpReply::make304(), Adaptation::Icap::ModXact::makeRequestHeaders(), ACLHTTPReqHeaderStrategy::match(), ACLHTTPRepHeaderStrategy::match(), ACLRequestHeaderStrategy< header >::match(), ACLReplyHeaderStrategy< header >::match(), mcast_encode(), HttpRequest::pack(), HttpReply::packHeadersUsingFastPacker(), Http::Message::packInto(), Http::Message::parseHeader(), HttpRequest::parseHeader(), CacheManager::ParseHeaders(), Adaptation::Icap::ModXact::parseIcapHead(), Ftp::Server::parseOneRequest(), Adaptation::Icap::OptXact::parseResponse(), peerDigestRequest(), Http::Message::persistent(), HttpRequest::prefixLen(), prepareLogWithRequestDetails(), Ftp::PrintReply(), clientReplyContext::processConditional(), clientReplyContext::processExpired(), Http::One::Server::processParsedRequest(), HttpStateData::processReplyHeader(), purgeEntriesByHeader(), Http::Message::putCc(), HttpReply::redirect(), HttpReply::removeIrrelevantContentLength(), HttpReply::removeStaleWarnings(), HttpStateData::reusableReply(), Ftp::Relay::sendCommand(), Http::Message::setContentLength(), Ftp::Server::setDataCommand(), HttpReply::setHeaders(), UrnState::setUriResFromRequest(), Log::Format::SquidReferer(), Log::Format::SquidUserAgent(), Mgr::Inquirer::start(), CacheManager::start(), Ftp::Gateway::start(), HttpStateData::statusIfComplete(), StoreEntry::timestampsSet(), HttpReply::updateOnNotModified(), urlCheckRequest(), HttpReply::validatorsMatch(), varyEvaluateMatch(), Http::One::Server::writeControlMsgAndCall(), Ftp::Server::writeCustomReply(), Ftp::Server::writeErrorReply(), Ftp::Server::writeForwardedReply(), and Ftp::Server::writeForwardedReplyAndCall(). Definition at line 157 of file HttpRequest.h. Referenced by Client::adjustBodyBytesRead(), HttpRequest::clone(), ErrorState::compileLegacyCode(), StoreEntry::complete(), FwdState::completed(), FwdState::connectStart(), ErrorState::Dump(), gopherReadReply(), PeerSelector::handlePath(), Http::Tunneler::handleReadyRead(), Http::Tunneler::handleResponse(), Http::Tunneler::handleWrittenRequest(), ACLHierCodeStrategy::match(), neighborsDigestSelect(), peerNoteDigestLookup(), peerSelect(), prepareLogWithRequestDetails(), HttpStateData::processReplyHeader(), HttpStateData::readReply(), TunnelStateData::readServer(), FwdState::retryOrBail(), TunnelStateData::sendError(), clientReplyContext::sendMoreData(), Client::sentRequestBody(), ConnStateData::serveDelayedError(), Client::serverComplete(), TunnelStateData::startConnecting(), switchToTunnel(), FwdState::syncHierNote(), StoreEntry::timestampsSet(), tunnelConnectDone(), tunnelServerClosed(), TunnelStateData::writeServerDone(), and HttpStateData::wroteLast(). Referenced by Format::Format::assemble(), ErrorState::BuildHttpReply(), clientReplyContext::buildReplyHeader(), Downloader::buildRequest(), HttpRequest::canHandle1xx(), clientBeginRequest(), clientProcessRequest(), ClientRequestContext::clientRedirectDone(), clientSetKeepaliveFlag(), HttpRequest::clone(), HttpReply::clone(), ErrorState::compileLegacyCode(), ErrorState::Dump(), Adaptation::Icap::ModXact::encapsulateHead(), HttpReply::hdrCacheInit(), htcpClear(), htcpQuery(), HttpStateData::httpBuildRequestHeader(), netdbExchangeState::netdbExchangeState(), HttpRequest::pack(), HttpRequest::packFirstLineInto(), HttpRequest::parseFirstLine(), Ftp::Server::parseOneRequest(), Http::Message::persistent(), prepareLogWithRequestDetails(), Adaptation::Ecap::FirstLineRep::protocol(), switchToTunnel(), tunnelStart(), and Adaptation::Ecap::FirstLineRep::version(). Definition at line 145 of file HttpRequest.h. Referenced by clientInterpretRequestHeaders(), HttpRequest::clone(), clientReplyContext::handleIMSReply(), HttpRequest::init(), and clientReplyContext::processConditional(). Definition at line 147 of file HttpRequest.h. Definition at line 152 of file HttpRequest.h. Referenced by Downloader::buildRequest(), clientBeginRequest(), clientFollowXForwardedForCheck(), Adaptation::Ecap::XactionRep::clientIpValue(), DelayId::DelayClient(), AccessLogEntry::getLogClientIp(), getOutgoingAddress(), HttpRequest::inheritProperties(), HttpRequest::init(), Adaptation::Icap::ModXact::makeRequestHeaders(), HttpRequest::manager(), and ACLFilledChecklist::setRequest(). Definition at line 168 of file HttpRequest.h. Referenced by HttpRequest::clone(), HttpStateData::httpBuildRequestHeader(), HttpRequest::init(), clientReplyContext::processExpired(), clientReplyContext::restoreState(), and clientReplyContext::saveState(). Definition at line 236 of file HttpRequest.h. Referenced by HttpRequest::clone(), FindListeningPortAddress(), Acl::TransactionInitiator::match(), UrnState::setUriResFromRequest(), and Adaptation::Ecap::XactionRep::updateSources(). Definition at line 114 of file HttpRequest.h. Referenced by ConnStateData::abortChunkedRequestBody(), StoreEntry::adjustVary(), asnCacheStart(), Format::Format::assemble(), ConnStateData::buildFakeRequest(), ErrorState::BuildHttpReply(), clientReplyContext::buildReplyHeader(), Downloader::buildRequest(), HttpStateData::buildRequestPrefix(), clientReplyContext::cacheHit(), HttpRequest::canonicalCleanUrl(), FwdState::checkRetriable(), clientGetMoreData(), clientHierarchical(), clientInterpretRequestHeaders(), clientIsContentLengthValid(), clientProcessRequest(), ClientRequestContext::clientRedirectDone(), clientSetKeepaliveFlag(), HttpRequest::clone(), ErrorState::compileLegacyCode(), FwdState::connectDone(), constructHelperQuery(), copyOneHeaderFromClientsideRequestToUpstreamRequest(), FwdState::dispatch(), ClientHttpRequest::doCallouts(), clientReplyContext::doGetMoreData(), ErrorState::Dump(), HttpRequest::effectiveRequestUri(), Adaptation::Icap::ModXact::encapsulateHead(), esiBufferRecipient(), Adaptation::Icap::ModXact::estimateVirginBody(), HttpReply::expectedBodyTooLarge(), HttpRequest::FromUrl(), ftpSendPassive(), Ftp::Gateway::Gateway(), ClientHttpRequest::gotEnough(), ClientHttpRequest::handleAdaptedHeader(), Ftp::Server::handleRequest(), StoreEntry::hasIfNoneMatchEtag(), HttpStateData::haveParsedReplyHeaders(), htcpClear(), htcpQuery(), httpStart(), HttpRequest::init(), HttpRequest::initHTTP(), ConnStateData::initiateTunneledRequest(), HttpStateData::keepaliveAccounting(), ACLMethodStrategy::match(), HttpRequest::maybeCacheable(), Client::maybePurgeOthers(), Adaptation::Ecap::RequestLineRep::method(), HttpRequest::pack(), HttpRequest::packFirstLineInto(), HttpRequest::parseFirstLine(), CacheManager::ParseHeaders(), peerAllowedToUse(), peerDigestRequest(), peerSelect(), HttpStateData::persistentConnStatus(), HttpRequest::prefixLen(), prepareLogWithRequestDetails(), clientReplyContext::processExpired(), clientReplyContext::processMiss(), clientReplyContext::processOnlyIfCachedMiss(), Http::One::Server::processParsedRequest(), clientReplyContext::processReplyAccessResult(), Ftp::Gateway::processReplyBody(), ClientHttpRequest::processRequest(), clientReplyContext::purgeDoPurgeHead(), clientReplyContext::purgeFoundObject(), clientReplyContext::replyStatus(), FwdState::secureConnectionToPeerIfNeeded(), clientReplyContext::sendNotModified(), clientReplyContext::sendNotModifiedOrPreconditionFailedError(), Http::Stream::sendStartOfMessage(), ConnStateData::serveDelayedError(), Ssl::ServerBump::ServerBump(), Ftp::Server::setReply(), clientReplyContext::setReplyToReply(), Client::startAdaptation(), clientReplyContext::startError(), HttpStateData::statusIfComplete(), storeGetPublicByRequest(), storeKeyPublicByRequest(), switchToTunnel(), testHttpRequest::testCreateFromUrl(), testHttpRequest::testIPv6HostColonBug(), clientReplyContext::traceReply(), HttpStateData::truncateVirginBody(), tunnelStart(), Adaptation::Ecap::RequestLineRep::uri(), urlCanonicalFakeHttps(), urlCheckRequest(), urlMakeAbsolute(), and urnHandleReply(). Definition at line 155 of file HttpRequest.h. Referenced by Downloader::buildRequest(), clientBeginRequest(), DelayId::DelayClient(), ClientHttpRequest::doCallouts(), HttpRequest::getRangeOffsetLimit(), HttpRequest::inheritProperties(), HttpRequest::init(), HttpRequest::manager(), ACLFilledChecklist::setRequest(), and tunnelStart(). Definition at line 175 of file HttpRequest.h. Referenced by HttpRequest::clean(), HttpRequest::inheritProperties(), HttpRequest::init(), HttpRequest::manager(), ACLMyPortNameStrategy::match(), and ConnStateData::postHttpsAccept(). Definition at line 173 of file HttpRequest.h. Referenced by copyOneHeaderFromClientsideRequestToUpstreamRequest(), HttpStateData::httpBuildRequestHeader(), HttpRequest::init(), HttpRequest::prepForDirect(), and HttpRequest::prepForPeering(). Definition at line 166 of file HttpRequest.h. Referenced by httpFixupAuthentication(), HttpRequest::init(), HttpStateData::sendRequest(), switchToTunnel(), and tunnelConnectDone(). Definition at line 164 of file HttpRequest.h. Referenced by clientReplyContext::buildReplyHeader(), copyOneHeaderFromClientsideRequestToUpstreamRequest(), httpFixupAuthentication(), HttpRequest::init(), HttpRequest::prepForDirect(), and HttpRequest::prepForPeering(). Referenced by HttpRequest::clone(), HttpReply::clone(), MemStore::copyFromShmSlice(), Http::Message::httpMsgParseStep(), HttpRequest::init(), HttpReply::init(), and Http::Message::parseHeader(). Definition at line 143 of file HttpRequest.h. Referenced by Http::Stream::buildRangeHeader(), CheckQuickAbortIsReasonable(), HttpRequest::clean(), clientInterpretRequestHeaders(), HttpStateData::decideIfWeDoRanges(), Http::Stream::getNextRangeOffset(), HttpRequest::hdrCacheInit(), HttpRequest::ignoreRange(), HttpRequest::init(), Http::Stream::lengthToSend(), HttpRequest::multipartRangeRequest(), Http::Stream::noteSentBodyBytes(), Http::Stream::prepareReply(), clientReplyContext::processReplyAccessResult(), Ftp::Gateway::restartable(), and Http::Stream::socketState(). If defined, store_id_program mapped the request URL to this ID. Store uses this ID (and not the URL) to find and store entries, avoiding caching duplicate entries when different URLs point to "essentially the same" cachable resource. Definition at line 139 of file HttpRequest.h. Definition at line 177 of file HttpRequest.h. Referenced by Format::Format::assemble(), HttpRequest::clean(), HttpRequest::clone(), copyResultsFromEntry(), DelayId::DelayClient(), HttpRequest::init(), and ACLTagStrategy::match(). Definition at line 115 of file HttpRequest.h. Referenced by Ftp::Gateway::appendSuccessHeader(), asnCacheStart(), Format::Format::assemble(), ConnStateData::buildFakeRequest(), Http::One::Server::buildHttpRequest(), Downloader::buildRequest(), HttpStateData::buildRequestPrefix(), Ftp::Gateway::buildTitleUrl(), clientReplyContext::cacheHit(), HttpRequest::canonicalCleanUrl(), carpSelectParent(), Ftp::Gateway::checkAuth(), HttpStateData::checkDateSkew(), DestinationIPLookup::checkForAsync(), Ftp::Gateway::checkUrlpath(), HttpRequest::clean(), clientHierarchical(), clientInterpretRequestHeaders(), clientProcessRequest(), ClientRequestContext::clientRedirectDone(), HttpRequest::clone(), ErrorState::compileLegacyCode(), FwdState::connectStart(), HttpStateData::continueAfterParsingHeader(), copyOneHeaderFromClientsideRequestToUpstreamRequest(), ICP2State::created(), FwdState::dispatch(), doV2Query(), ErrorState::Dump(), HttpRequest::effectiveRequestUri(), Adaptation::Icap::ModXact::encapsulateHead(), HttpRequest::FromUrl(), ftpFail(), ftpReadType(), Ftp::Gateway::ftpRealm(), ftpSendType(), ftpSendUser(), ftpTrySlashHack(), getDefaultParent(), getFirstUpParent(), TunnelStateData::getHost(), getRoundRobinParent(), getWeightedRoundRobinParent(), gopher_request_parse(), gopherSendComplete(), HttpStateData::httpBuildRequestHeader(), clientReplyContext::identifyFoundObject(), HttpRequest::init(), HttpRequest::initHTTP(), Security::BlindPeerConnector::initialize(), Ssl::PeekingPeerConnector::initialize(), ConnStateData::initiateTunneledRequest(), internalStart(), ACLUrlPortStrategy::match(), ACLUrlPathStrategy::match(), ACLProtocolStrategy::match(), ACLUrlLoginStrategy::match(), ACLDestinationASNStrategy::match(), ACLDestinationDomainStrategy::match(), ACLServerNameStrategy::match(), ACLDestinationIP::match(), HttpRequest::maybeCacheable(), neighborsHtcpReply(), neighborsUdpAck(), neighborsUdpPing(), netdbClosestParent(), netdbExchangeStart(), Ssl::PeekingPeerConnector::noteNegotiationDone(), operator<<(), HttpRequest::pack(), HttpRequest::packFirstLineInto(), HttpRequest::parseFirstLine(), peerAllowedToUse(), peerDigestRequest(), ConnStateData::pinConnection(), ConnStateData::postHttpsAccept(), HttpRequest::prefixLen(), HttpStateData::processReplyBody(), HttpStateData::processReplyHeader(), clientReplyContext::purgeRequest(), FwdState::secureConnectionToPeerIfNeeded(), HttpStateData::sendRequest(), ConnStateData::serveDelayedError(), Ssl::ServerBump::ServerBump(), UrnState::setUriResFromRequest(), PeerPoolMgr::start(), FwdState::Start(), Ftp::Gateway::start(), testHttpRequest::testCreateFromUrl(), testHttpRequest::testIPv6HostColonBug(), tunnelConnectDone(), Http::Tunneler::Tunneler(), Adaptation::Ecap::RequestLineRep::uri(), urlCanonicalFakeHttps(), urlCheckRequest(), urlMakeAbsolute(), Ftp::UrlWith2f(), FwdState::usePinned(), ConnStateData::validatePinnedConnection(), Adaptation::Service::wants(), and whoisStart(). Definition at line 171 of file HttpRequest.h. Referenced by StoreEntry::adjustVary(), HttpRequest::clean(), HttpRequest::clone(), HttpRequest::init(), clientReplyContext::processExpired(), clientReplyContext::purgeDoPurgeHead(), storeKeyPublicByRequestMethod(), and varyEvaluateMatch(). Definition at line 188 of file HttpRequest.h.